If you’re looking for a world-class deck construction company to provide you with a sturdy and eye-catching outdoor living area in Richmond, Virginia, the expert work provided MR. FIX-IT™ is just what you need. We’re a locally owned and operated remodeler that has been helping area residents since 1970, and we’ll be happy to outfit your home with a beautiful and extremely durable deck from industry leader TAMKO. 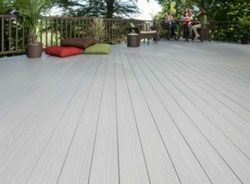 The TAMKO decking boards that we use are made of a proprietary wood pulp and laminate polymer composite that maintains the appearance of real wood without any of wood’s frailties. This sturdy deck construction material means that our decks will never rot, expand, or become waterlogged, and they are also highly resistant to mold, mildew, and insect infestation. As a result of this durability, you’ll be able to enjoy your deck for years to come with minimal need for maintenance beyond a periodic cleaning with soap and water. To learn more about our deck construction services and how they can help you company in Richmond, VA, contact MR. FIX-IT™ today.